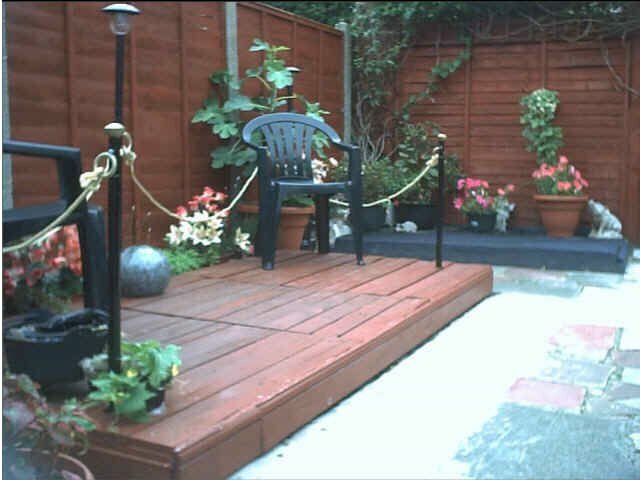 You can make free garden decking from old pallets found dumped or begged from shops. I made one from 4 pallets. 3 x pallets were put lengthwise, side by side. I fastened them safely together at the back and front with old pieces of metal with holes for screws in them. Any damage can be repaired with wood from the fourth pallet. I then covered front and sides with long lengths of old boards to keep them firmly together and painted with left-over fence paint. You can finish off with any kind of railing/fencing/rope you need to complete the look. I used 5 x 4ft metal poles (which were part of a dismantled child's' swing) and concreted them around the pallets at corners and middle of the back. 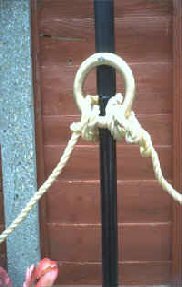 I then strung the old plastic rope from the swing from one pole to another using old curtain rings (sprayed gold) as rope holders. Let the plastic rope swing down between each pole and you have an instant 'classical' look to the edges of the pallets/decking. I finished the end of poles off with old plastic doorknobs painted gold to look like finials. 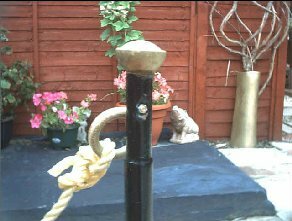 I have put a solar light on to the back post of the 'decking' just to give a glow on an evening. Anyone wanting to put railing/fencing around the area could easy make something a lot more professional than mine but I wanted to construct it using only old materials to see how much recycling I could do and at the time of construction I was also looking to save as much money as possible. Even the bolts used on the curtain rings were recycled old rusty ones from a friend which I cleaned up. Decking boards could be put over the pallet wood for a more streamlined finish also. Total cost: £2 for long screws and nails, £1 for gold spray paint, £1 for quick set concrete. Time taken to construct 1 hour 20 minutes. Instant decking which is at least 15-20cms (9-12 ins) high.